Using filters in your email client is the recommended method for filtering spam in your email. However, if you have enabled Spam Box a spam folder is automatically created on the server and spam messages are moved there automatically. 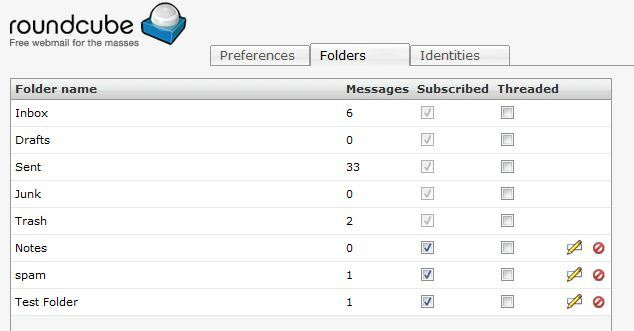 Of the three webmail clients offered with InMotion Hosting, Horde will usually automatically show that folder but you will need to subscribe to the folder if you prefer to use a different webmail client. Click to expand your folder tree and you should see the spam folder. Click on the "Folder Actions" link on the left of the screen. Choose the "Show All Mailboxes" option from the drop-down box. Right click on the spam folder. Click the Subscribe option, and then click OK in the popup window. 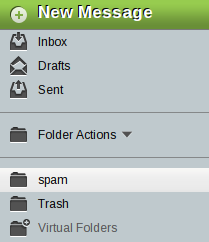 Click "Check mail" to refresh your folder list and you should now see the spam folder. In the top right of the screen click "Settings"
If you are using an email client such as Thunderbird or Outlook with an IMAP connection, the steps to subscribe to folders can vary from client to client. If you have any trouble subscribing to the spam folder from your local email client, you can easily subscribe to the spam folder in webmail and then be able to view the folder in your email client. You may need to close and restart your email client for the changes to take effect. If you need further assistance please feel free to contact our support department. It appears that the new version of Horde does not work in this way. We will need to update the article for the newer version. Thank you for bringing it to our attention. For Horde 5.2.6 click on the dropdown that says 'Folder Actions' on the left. Then select 'Show All Mailboxes'. please help me recover my password in my yahoo email accnt thank u.
Yahoo has a variety of options and tutorials that can help you with this. Please see Yahoo's documentation for password reset. I hope this helps to answer your question, please let us know if you require any further assistance.